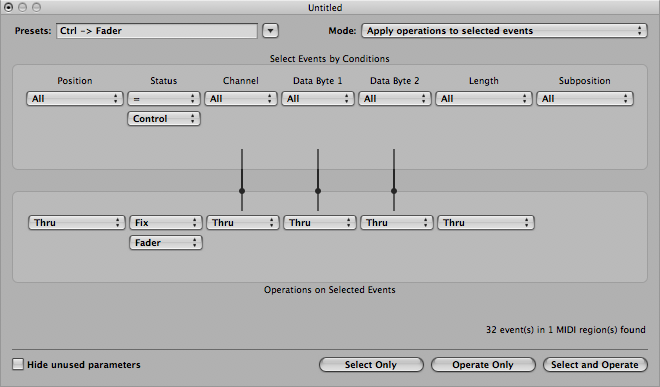 I must have been one of the many trying to figure out how to turn midi events (such as note-ons or control data) into plugin fader movements – or region automation. It’s actually easier than though at first, and can be done in a few different ways. I’m definitely not sure whether this is the fastest and simplest way (Logic being such a black hole of customising), but it’s damn effective. First, record a few bars of random notes, one at a time (1/8ths, whatever), just keep within the C1-C6 limits. Second, prepare a few Transform sets. The first one is meant to convert the note-ons of a 5-octave keyboard into control data (or fader data, just replace the resulting Control selection with Fader, in the lower section). Since the note-ons include also note-offs, they need to be erased from the resulting control data. Of course, it’s not mandatory to use note-ons, one could just as easily twiddle some knobs (sorry) or throw faders – or wiggle the joystick until it perishes. What I’d like to emphasize is to clean up all unwanted data by quantizing or removing all unnecessary note-ons to produce clean stream of controls. Note that this Transform Set doesn’t produce zeros, it scales the bottom C1 of the 5-octave keyboard to 1 and highest C6 to 127 and everything else in between them. The resulting data is tidied up by another Transform Set. 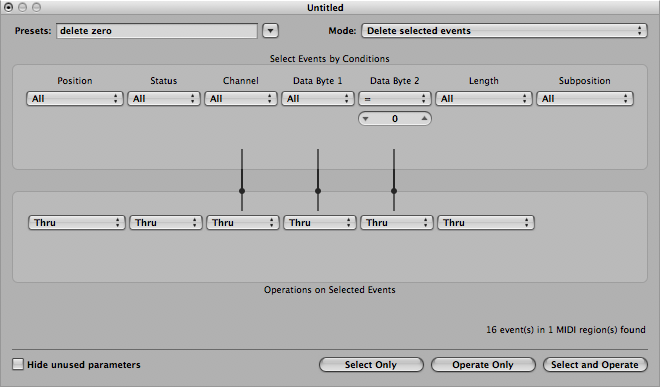 With this, all zeros caused by note-offs are deleted – just remember to press “Select” first, then “Operate”, or if you’re certain and confident enough, press “Select and Operate”, but be warned: my Logic Pro 8.0.2 doesn’t always work correctly. Sometimes it just decides to delete everything in the event list. A bug, perhaps? What you’ll have in the Event List are only the control data events, between 1 and 127, which you’re about to use as such, or convert into something more comfortable. You could, however, combine this and the following into one Transform Set. 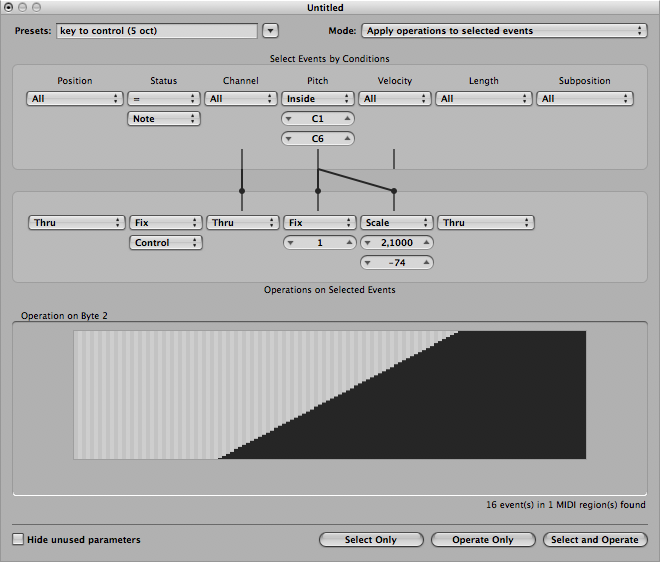 Create another Transform Set and use it to convert freshly-created Control data to Fader data. If you already have plugins in any of the insert slots, you’ll probably see some parameters in the Length/Info field of an Event List. Note: on the Audio Tracks, insert slot #1 is on a MIDI Channel 2, slot #2 is Channel 3 and so forth – with Instrument Tracks, the first effect insert slot is MIDI Channel 3, slot #2 is MIDI Channel 4, etc. ad nauseam. Next, activate a plugin on an insert slot of an Audio Track (or Instrument). 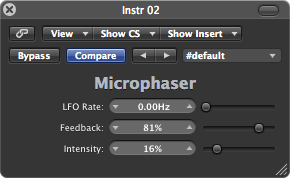 Say, you’re trying to create a “random phaser”: insert MicroPhaser. If everything’s gone well, you should have a) Audio or Instrument Track with a few bars of “Fader” data AND MicroPhaser in the first insert slot of that particular track. Double click on the Fader data region, it should open in the Event List on the right hand side of the Logic Pro’s main view. If not – well… click on the region, make sure you’ve got the preferences right (Preferences – Global – Editing – Double clicking a MIDI region opens Event List) and try again. 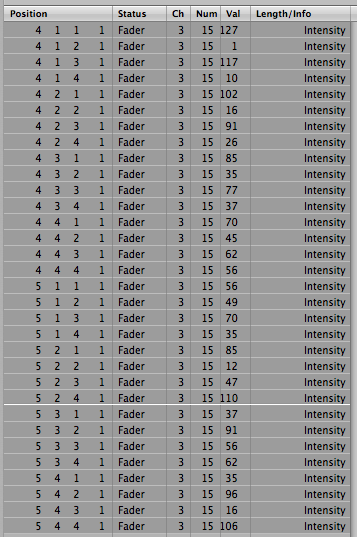 Now there should be a list of Fader data. Select all and set the “Ch” accordingly: on an Audio Track, insert slot #1, use MIDI Channel 2, on an Instrument Track, insert slot #1, use MIDI Channel 3. Click on the “Val” column and roll your mouse. You should see the parameter list – sometimes the plugin control numbers are found in different places, with MicroPhaser, its Intensity control was Channel 3, control Num 15. If you have put an audio region onto your track, you’ll hear some random phasing going on if you hit Play. Yes, Audio Tracks can play back Midi Regions containing Fader data! Word of warning here, though: Some plugin parameters understand restricted values, for instance, Echo plugin’s Time can be selected from 1 to 11 only, though sending in Value 127 doesn’t crash Logic… at least immediately. Saving often is recommended when experimenting and I can’t emphasize enough it’s about time Apple developers create an Auto-Save for Logic. It’s about men in Mars and we still struggle without Auto-Save! What is this, Sysmä or Oregon? Also, some plugins tend to cause clicks when changing the parameters if there’s something running thru them. Of course, glitch fans go crazy as soon as they try any of these tricks on Delay plugins. Just be careful with Delay Designer’s parameters: it was the only one causing VERY much hassle, although nothing was permanently gone, as long as your project is properly saved. ← Noise… eh, space design?